Let's talk about double tracking for a second. The process of doubling instruments and vocals has been around for decades, although the process was particularly annoying for vocals. John Lennon was so peeved with the vocal doubling process that he indirectly forced Ken Townshend to devise a mechanical method for double tracking. Thus was born the somewhat complicated tape method of double tracking, and recording technology was subsequently advanced. This sweetening technique is something that's eluded players since that fateful day in Abbey Road studios. Chorus pedals have tried, but they're just not the same. And short of carting tape machines around everywhere, nobody's been able to accurately replicate it. Leave it to Keeley, then, to cram all the double tracker features one could ever want into a compact package. 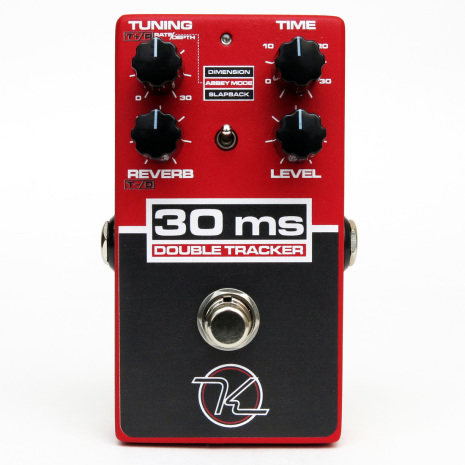 Enter: the 30 ms Double Tracker. 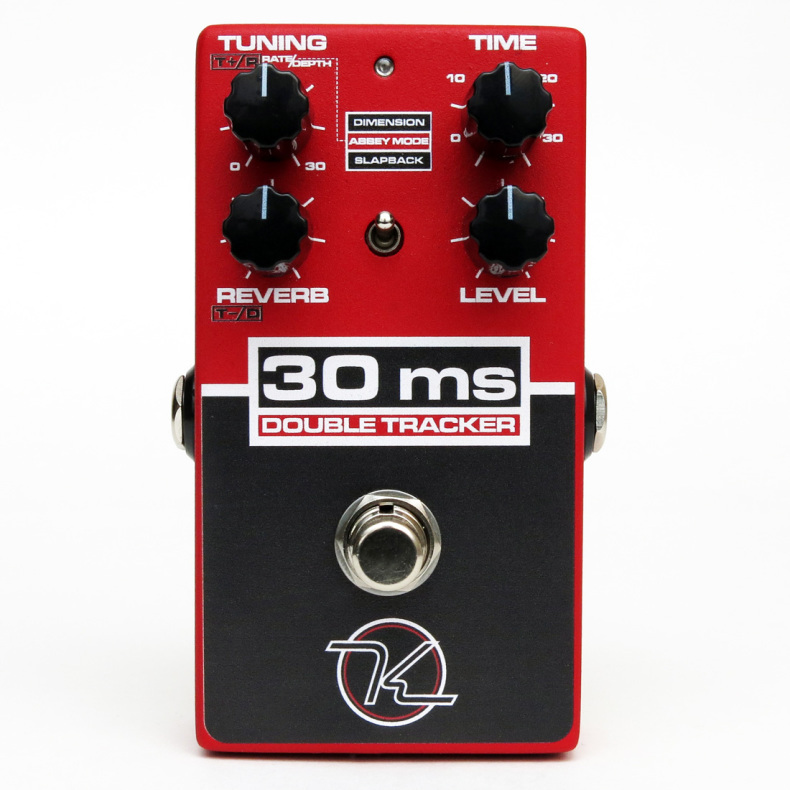 Keeley has oufitted this effect with several control parameters to truly cement its place on your pedalboard or in your studio. There's a Tuning knob that tunes the signal between +/- 30 cents (in Abbey Mode it adjusts rate and depth). 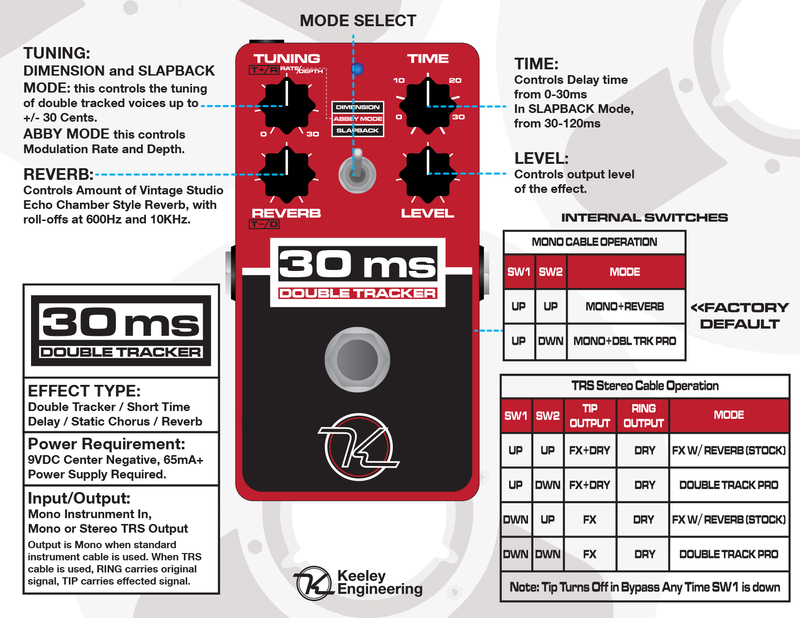 The Time knob adjusts the milliseconds of delay from 0 to 30 (in Slapback mode, 30 to 120ms). An onboard reverb can be dialed in with its eponymous knob, with frequency rolloffs of 600Hz and 10kHz. The three modes are Dimension, Abbey Mode and Slapback. Dimension mode is a classic double tracker featuring two voices, adjustable with the Tuning knob. Slapback adds to this by expanding the delay time to 120ms, while retaining the voices. Abbey Mode calls back vintage tape-tracking, with a modulation control to emulate a gentle-worn tape machine.